Ding! Ding! Ding! 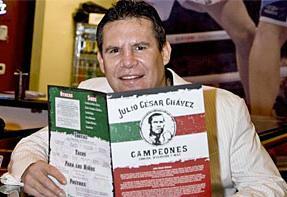 Julio César Chávez Campeones Now Open for Business in Mesa, Ariz. — After months of anticipation, six-time world boxing champion and Mexican icon Julio César Chávez will open Julio César Chávez Campeones, a one-of-a-kind boxing-themed restaurant and entertainment venue, today, Tues., Nov. 10.